This past month, I decided to take my first trip to England to see Stamford Bridge and to catch a couple Chelsea matches, as well as a few others. As an American, it’s not always easy to get over here, what with airline prices and such, but it was this year that I decided to spend the money and see what I obviously had been missing from so many miles away. The first week was spent in London seeing the sights and also visiting the Bridge for Chelsea’s match with Aston Villa, but it was travelling to Stoke-on-Trent to see Chelsea’s Capital One Cup match against Stoke City that intrigued me the most. 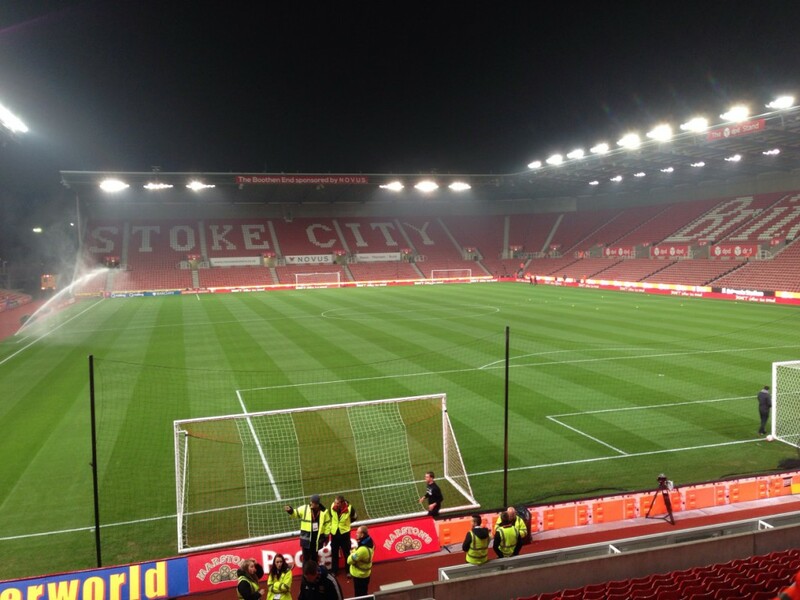 As a football fan, you always hear the old cliché of the wet, windy night at Stoke. It’s interesting to find out how true that cliché is. First thing about the Britannia Stadium is that the whole thing sits on top of a hill. It’s not a terribly big hill, but it’s a hill nonetheless, and it raises the stadium above a lot of the buildings and exposes it to the wind. Secondly, the two corners of the stadium on either side of the main stand are both open and not connected to the other three stands, which sit in a ¾ oval. That obviously doesn’t help the wind. Oh, and a nice heavy drizzle fell for most of the night added the rain factor. 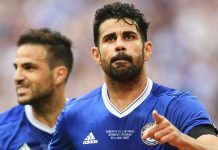 Before the match, I’d been told about the atmosphere from Chelsea’s away support, particularly compared with the atmosphere at Stamford Bridge, and I was curious to see what it was like. I’d experienced a rather large range of atmospheres in American sports, from the rather tame atmosphere of baseball, where the only real problem is the number of people getting up during the game to go get food, to the more aggressive atmosphere at an American football game, where occasionally a beer is thrown by accident since drinking in the stands is allowed and drunken people forget that they’re holding a drink when celebrating. Football crowds, though, are a bit different and diverse, especially amongst the away supporters. At Stamford Bridge, I noticed from my seat in the corner of the Matthew Harding Lower that song and passion was present, but it was all a bit relaxed among supporters enjoying the match. On my visit to Stoke, there were people who, like myself, wanted to watch the match and take in the sport, but above me were a group of 18-to-20-somethings who seemed more focused on drink and being as loud as possible, leading to a couple seats being maimed in the process. It all contributed to a great away atmosphere, one that I was interested in experiencing for the first time. It also didn’t hurt that Chelsea were allocated nearly 5,000 tickets. As far as the football itself, there were a couple things I noticed in the match against Stoke. Firstly, the papers insist that some of the Chelsea supporters may be wavering in their backing of Jose Mourinho. At least amongst those who travel to follow the team away from home, that’s not the case, as his name was sung a number of times, prompting waves from the manager towards the supporters’ end. Secondly, it’s clear that Chelsea is short of ideas and confidence at the moment in the final third. There’s no real cutting edge at the moment. The team seems to build play nicely until they reach the top of the box, and it’s almost like they freeze. When the decisive through ball doesn’t present itself, the team almost stops and plays the ball short. It gets frustrating because no one puts crosses in and they tend to just play the ball around the outside of the area and go nowhere. Thirdly, it’s clear how much Branislav Ivanovic is missed, even despite his poor form. Kurt Zouma is clearly not a right back, as his ability to attack is slightly lacking. His default option was to take the safe pass, usually back to the defence, and not putting crosses into the box. As wayward as Ivanovic’s crosses have been, at least he was willing to cross the ball. Overall, seeing Chelsea in person has given me a greater sense of the passion of the Stamford Bridge faithful. I visited a couple other football grounds during my visit, and I can see why Mourinho and others hold such an admiration for the supporters of English football. It also makes me want to come back as soon as possible.